At the end of the Holmes canon, Holmes retires to the country to keep bees. But what caused him to retire? As Mr. Holmes shows us, it was a case that affected him like none other, a case from more than 30 years ago — relative to the film, which takes place in 1947. Holmes, now 93, has just returned from a trip to Japan and is somewhat infirm. While able to move around with the assistance of his cane, he still requires care, in the form of his housekeeper and her young son. When it becomes clear that he’s losing the details of his past, Holmes’s doctor tells him to record in a diary every time he forgets a name or a place. Holmes, the obsessive that he is, is trying to remember the last case he worked, to put it to paper. And that’s all about the details. Meanwhile, Mrs. Monroe (the housekeeper) and her son Roger are doing their best to care for Mr. Holmes. Roger in particular takes a liking to Holmes, forming a friendship that I wouldn’t necessarily call “unlikely” — Holmes always appreciated those who used their intellect, and Roger, who’s read the Holmes stories as published by John Watson, wants to emulate him. In time, the details of Holmes’s final case are revealed, just in time for tragedy to strike. 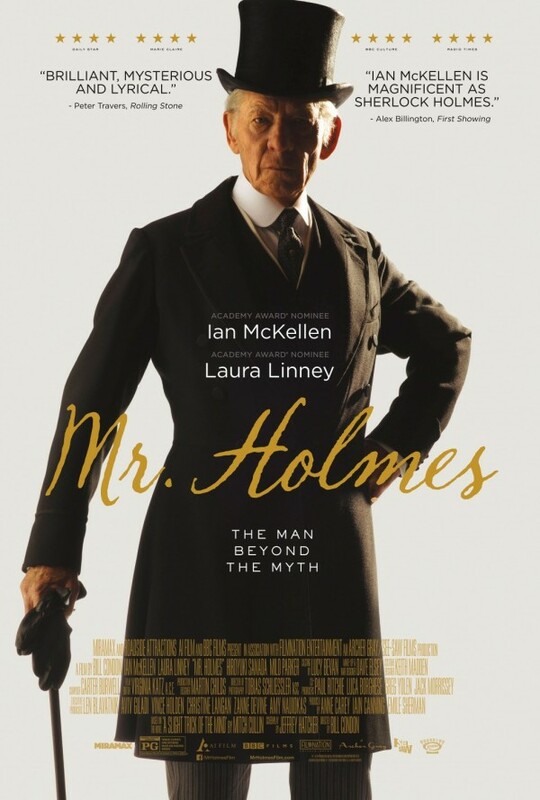 Mr. Holmes, based on the Mitch Cullin novel A Slight Trick of the Mind, stars the great Sir Ian McKellen as Holmes. He actually plays two versions of the character: a 93-year-old man facing his own mortality while trying to remain vital, and a 68-year-old man still engaging in his calling as a detective. McKellen, himself 76, nails the older version of Holmes, but the younger one, for me, was slightly harder to believe. Not that McKellen didn’t act it well, but I’d never seen Holmes looking like that. To me he always looked more like Jeremy Brett: tall, thin, and austere. And that was even before I’d seen Brett as Holmes on PBS. McKellen, even as Holmes, has a kind, grandfatherly look about him that may not have fit the character quite right. Joining McKellen are Laura Linney (The Truman Show) as the housekeeper Mrs. Monroe and Milo Parker (the forthcoming Mrs. Peregrine’s Home for Peculiar Children) as her son Roger. Parker, I think, does an excellent job for an actor with only four credits on IMDB, and it helps that he looks a bit like Thomas Brodie-Sangster (Game of Thrones) did when that actor played in Love Actually with Linney. He portrays a serious boy who’s curious about the great man that he must help to care for, a boy who wants to stretch his intellect and knows the only way to do it, in his small world, is to engage one of the smartest men of his time. Linney is fine too, but I kept getting distracted by the fact that I haven’t seen her in anything in a while and mentally overlaying her earlier roles on this one. My fault. Also in the film: Hiroyuki Sanada (The Wolverine) as Holmes’s correspondent in Japan, Hattie Morahan (the forthcoming Beauty and the Beast) and Patrick Kennedy (Boardwalk Empire) as the Kelmonts, and Frances de la Tour (Harry Potter and the Goblet of Fire) as Madame Schirmer. There are also a lot of bees, and I wonder how many were digital and how many were actual insects. 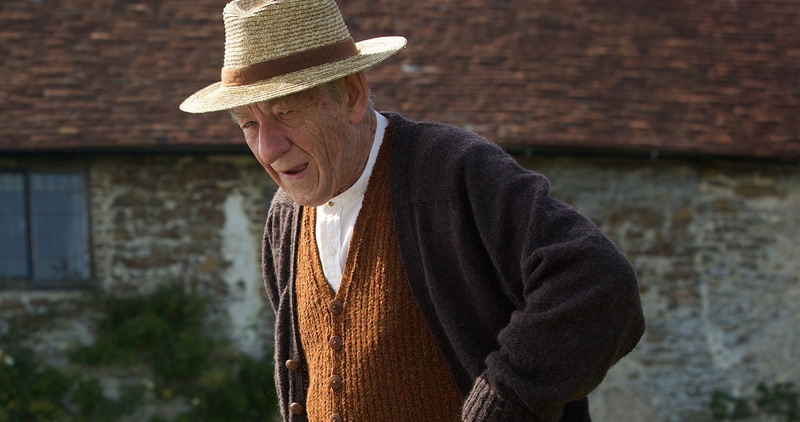 According to IMDB, McKellen took a beekeeping course prior to making the film and was not stung. Directed capably by Bill Condon (Breaking Dawn) from a script by Jeffrey Hatcher (more a playwright, though he has written a few screenplays), the film takes us to London, Japan, and Sussex, and on a journey through Holmes’s mortality and the regrets he now feels as he faces the end of his life. Carter Burwell (who worked with Condon on Breaking Dawn) provides music in the vein of the composers of Sherlock and the Robert Downey-led Sherlock Holmes films, but more somber and slow, as befits the current phase of Holmes’s life. As someone with grandparents currently facing some of Holmes-the-elder’s ailments, I found the writing and portrayal to be both accurate and disturbing. While it’s not new to tell a story from the point-of-view (mostly) of an older person dealing with age-related issues*, I think the impact comes not only from how well the role was played but also from how we as a viewing audience see Sherlock Holmes as a part of the cultural collective unconscious. To us, Holmes is always a tall, spare man with an enormous intellect, and he’s always joined by Dr. Watson, his close friend and confidante. Watson only appears briefly in this film, as does Holmes’s brother Mycroft and his housekeeper Mrs. Hudson, for Holmes has moved beyond the days when those contemporaries were… well… contemporary (to him). In the stories, Holmes always said he was alone and isolated, but in Mr. Holmes he comes fully face-to-face with that fact and finds it daunting. I found Mr. Holmes to be a good film. It’s very slow — I looked at my watch once and was surprised to see that only an hour had passed (the film is 104 minutes, and only three of them are the end credits) — and there’s almost no action whatsoever, so if you’re expecting something more along the lines of Sherlock, you’ll be disappointed. However, if you’re a fan of Holmes as Conan Doyle originally wrote him, then I think this film will resonate quite strongly. It’s visually pleasing, and the ending won’t leave you unsatisfied. However, if you’re not a huge fan of Holmes or McKellen, you might want to wait for Redbox or VOD, because while I enjoyed the movie, I don’t think it was worth $11.50, and there’s nothing about it that necessarily needs a large screen. This film contains very slight language and one scene of peril, as well as occasional smoking and allusions to drug use. However, I think the biggest issue for children is the emotional impact of seeing Holmes as an old man and worrying about their own grandparents. Of course, you should use your own best judgment when it comes to your children. Josh Roseman (not the trombonist; the other one) lives in Georgia. His fiction has appeared in Asimov’s, Escape Pod, and the Crossed Genres anthology Fat Girl in a Strange Land. Find him online at roseplusman.com or on Twitter @listener42, check out his column “Six of the Best” over @nerderypublic, and maybe, if you want to, pick up some of his writing over at Amazon. * Patrick Stewart, McKellen’s good friend, did a similar turn in the more action-oriented film Safe House, which resonates strongly with me because of how Stewart’s character dealt with his failing memory, an ailment that even at my relatively-young age is something that I too have to face.